Quick and simple Charming Azuki Kanten recipe prepared from azuki beans, kanten (agar agar), vanilla or cinnamon. 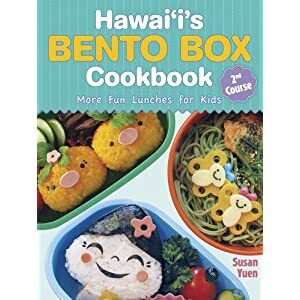 Order Hawaii's Bento Box Cookbook - Hawaii's Bento Box Cookbook 2nd Course presents a new assortment of imaginative bento and ono dishes that will make lunch a one-of-a-kind treat for even the pickiest of eaters. Wash Kanten under running water &squeeze excess water out of Kanten. Tear washed Kanten into small pieces and soak in the pot of water for 15 minutes. Then cook Kanten until dissolved, stirring all the while. Add sugar and salt. Then add the can of Azuki beans - stir constantly for at least 5 minutes until the beans are thoroughly warmed. Remove the pot from stove and pour the Kanten and Azuki beans in a flat pan. Cool and refrigerate until hardened.